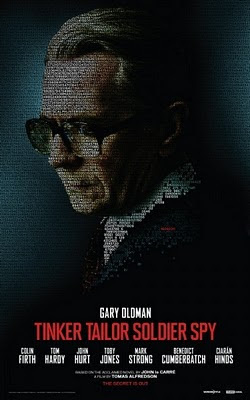 I had such a visceral reaction against Tomas Alfredson’s much vaunted new film adaptation of John le Carre’s 1974 novel “Tinker, Tailor, Soldier, Spy” that I couldn’t bring myself to review it for some time. I have decided that the best way to explain this reaction is to describe what I believe to be the strengths of John le Carre as a writer; what I respond to so strongly in his novel; my response to the seminal Alec Guinness TV series and the more recent Simon Russell Beale radio series; and finally why I feel that Alfredson’s adaptation does a disservice to that novel. Naturally, this essay contains many spoilers. It also contains, more than usual, a deeply subjective reaction to the material being discussed. I do not pretend that my objections to this film will be shared by many who watch the film. Indeed, contrary to my view of the film as muddled, crass, arid, and fundamentally mis-judged, the movie is being touted as an Oscar contender, no less. To my mind, John le Carre is one of the finest novelists of the twentieth –and indeed twenty-first century. Because he happens to cast many of his explorations of character and geopolitics in the guise of spy novels, he is typically seen as a genre writer. I think this is a tremendous mistake, and underplays his ability to pen compelling, fully developed characters, and to explore the complications and compromises with which we all live – at a personal, professional and political level. He is, for me, the ultimate essayist on the post-modern condition – the difficulty of living in a world that lives in the shadow of the horrors of World War Two – where moral absolutes have been shaken, and the triumphant est has been somehow sullied and compromised. And he is, par excellence, the great chronicler of the particular condition of post-war Britain – the country that won World War Two, but was bankrupted in the process - and ultimately lost its Empire and its place as a first-tier global power. What John le Carre does – what makes him so compelling - is that he explodes the myths of glamour and success and the clear lines between ally and enemy that make the Bond novels so facile and fantastic, in the literal sense of the word. Ian Fleming depicted a Britain that was in suspended animation – forever at the high water mark of World War Two. Fleming’s novels depict a country that has retained its sense of moral and even intellectual superiority, an equal player in the Great Game of the Cold War. The reality of course, was dramatically different - and it’s this drastic psychic adjustment that John le Carre depicts so brilliantly. He shows us the tragedy of Cold War espionage – a tragedy both of process and purpose. The process is bureaucratic, thwarted by internal politics, and housed in dank, drab, unspectacular offices in the crappier parts of London. It’s a world of chits, weak tea, the patient stake-out, blown missions and shoddy furniture. The purpose is similarly shabby. A generation of men raised to Empire is consigned to low-level voyeurism in order to puff up the delusional belief that a post-imperial Britain is still a major player in foreign affairs. Any romantic notion of derring-do seems faintly ridiculous. The most that the Cold War British spy can cling to is the notion that there is some kind of moral superiority – that after all, for all the frailties of post-Imperial Britain, they do not at least suffer from the Soviet disease of fanaticism. The novel “Tinker, Tailor, Soldier, Spy” is framed as an investigation. Retired spy George Smiley is called in by his political masters to investigate allegations that there is a Soviet mole, “Gerald” at the top of the British Secret Intelligence Service, known as “The Circus”. Smiley comes to believe that the mole exists, that he has been passing high level secrets from the Americans to the Soviets – secrets bought from the Americans with counterfeit intelligence, “Witchcraft” supplied by the Soviet spy-chief, “Karla”, through a double-agent that the mole is running. Thus, not only is the Circus thoroughly compromised but Britain has been made to look a fool in the eyes of her American allies – thoroughly underlining our second-rate status in the post-war world. This investigation takes place through careful reading of old documents, and interviews with retired Circus spies. This is a battle of wits – intelligence – information-gathering – carried out in back-street bed-and-breakfast rooms, clapped out caravans and the quiet houses of Oxford. Pulses race when Smiley’s side-kick, Peter Guillam has to filch an old file from Circus – or when Smiley believes he is being followed – but this is not the main modus operandi of Smiley or Le Carre. This is the novel of the quiet, probing conversation, rather than the car chase. And, most importantly, even though Smiley succeeds in uncovering his mole, there is no real triumph. The Circus – and Smiley and Control’s legacy – is in tatters, and while he may take over as interim-head – this is no return to the pre-mole glory years of wartime intelligence. The slow decay is arrested but there is no restoration to the Circus’ previous stature. Karla still exists, the American allies still have the better of us, and Smiley is still painfully aware that he, essentially, an anachronism. What is the nature of the betrayal that has occurred? Of course, the mole, Bill Haydon, has betrayed, and as Smiley’s wife Ann says, he has betrayed completely – his class, his service, his country, his lovers, his friends. And it is Le Carre’s depiction of the emotional betrayals that I find even more compelling than his fascinating insights into the reality of post-war espionage. My contention is that “Tinker, Tailor, Soldier, Spy” is a love story first and foremost – and that in Le Carre’s world it is loyalty to a lover that marks out the “good man” in a post-modern world where there are few moral absolutes. George Smiley is a great romantic, not just in his taste for German literature, but because of his unfailing loyalty to his wife Ann, and despite her serial infidelity, her emotional loyalty to him. Karla see Smiley’s devotion to Ann as his blind spot, and exploits it by making Haydon instigate an affair with Ann – but Smiley sees it as his strength. Moral frailty, humanity is the only defense the West has against the fanaticism of the Soviet. This link – between love of Ann – and what makes the Cold War worth fighting, not to mention winnable, is key. And it’s why throughout the novel, characters are awkwardly asking Smiley to pass on their regards to Ann, or embarrassing Smiley with Circus gossip about her infidelity. It’s also why the pivotal scene in the novel will always be the meeting in post-war India, where Smiley tries to recruit a silent Karla, revealing far too much about himself, and allowing Karla to steal his cigarette lighter – an engraved gift from Ann. I also think that for me, the real resolution in the novel, the consequence of the investigation that matters most, is not Smiley’s re-instatement as acting Control, but his reconciliation with Ann. It’s as though exposing Haydon can clear the way for them to speak openly and honestly about what happened. There are other love stories that permeate the text. Indeed, the novel opens – the action is instigated – when Ricki Tarr, former Circus operative and tough guy, tells cabinet secretary Oliver Lacan that there is a mole in the Circus, information he has discovered through a love affair with a Soviet spy he now wants Circus to extradite. An imperfect love story to be sure – Iryna uses Tarr to get her message to Circus in exchange for defection – and Tarr uses his information to come back into the fold, and ideally bring both his lover and his common-law wife and child with him. A third key love story within the novel is that between Bill Haydon and his fellow Oxonian and Circus recruit, Jim Prideaux – the debonair artistic aristocrat and the athletic, no-nonsense side-kick. Fatefully, it is Prideaux that Control chooses to send on the doomed Operation Testify - an off-the-books mission to pick up a Soviet defector in the Czech Republic – a defector who knew the identity of the mole that Control was sure existed, and which Prideaux, in his heart, knew was Haydon. It is heartbreaking to conceive of Prideaux, suspecting Haydon, but still warning him that this mission would expose “the mole”, and perhaps suspecting that Haydon would have to sacrifice him to cover his identity. Consequently, the most scathing exchange between Smiley and Haydon concerns not his betrayal of Ann, nor of his country, but of Prideaux. Haydon admits that he sent Prideaux to his fate – it had to be someone that Control trusted, and it had to be a Czech speaker – and makes an excuse “well, I got him back, didn’t I?” Smiley responds, “Yes, that was good of you”. What depths of antipathy and disgust lie behind that response. This betrayal proves fatal. Prideaux strangles Haydon –an intimate assassination. The fourth love story is perhaps the most romantic – the love for the glamour and mystique of the “old Circus” – when the spies were fighting in a real war, with tangible enemies, before bureaucracy replaced daring exploits. It is this romantic love that the sacked researcher Connie Sachs – who first rumbled Gerald’s handler – feels for “her boys”. A romantic love that leads to disappointment and alcoholism. Connie tells Smiley that if it’s really bad, she doesn’t want to know, but her tragedy is that she does know already. If not the identity of the real mole, then the wider truth that the Old Circus is utterly shot. It is also the romanticism that leads the new generation of post-war spies to idealize Bill Haydon as a Lawrence of Arabia figure and to turn away from the quiet, dull methods of Smiley. Their disillusion – and anger – is depicted in the character of Peter Guillam, who punches Haydon when he is exposed in the safe house. It is a love that Smiley seems never to have had – always seeing things far more clearly – seeing himself as sort of “commercial traveler” trawling for defectors. But what makes him lovable is that he still has his love of Ann, his belief, ultimately in the West, for all its failings, and none of the cynicism that infects Roy Bland and the avaricious oleaginous Toby Esterhase. I wonder a little about Percy Alleline, the puffed up Scottish dupe who is catapulted to the head of the Circus on the tide of Witch-craft, the bureaucratic man who loves the apparent importance of secret committees. He seems to hold no love for the old Circus and yet does have that same romantic delusion that, through Witchcraft, Britain can once again be the power that it was. THE 1979 TV ADAPTATION AND THE 2009 RADIO ADAPTATION. The 1979 television adaptation of the novel is to my mind both perfect in its own right as television, and as an interpretation of the novel. It seems to get everything right, from casting, to atmosphere, to production design and the superlative opening and closing credits. The opening credits showing ever more angry Russian dolls opening to reveal a faceless doll at the core – and the final credits roll to the soundtrack of a college choir singing a beautiful new setting of the Nunc Dimittis – Smiley supposedly laying his legacy to rest although we know it is a partial and compromised peace that he wins. Of course, one could argue that the TV adaptation was bound to be nuanced and faithful, given that it had the luxury of seven hours of screen time, was filmed close to the time in which the novel was set, with a screenplay jointly penned by the author. But the recent 2009 BBC Radio 4 adaptation of the novel into a three-hour radio play suggests that is possible to condense the novel and retain its thematic richness. Shaun McKenna didn’t alter any of the structural and stylistic traits that made the novel successful. Specifically, he kept much of Le Carre’s dialogue – the wonderfully jargon-filled language of the Circus, particularly in the case of Connie Sachs. Second, he kept the Ricki Tarr-Iryna love story as the opening hook of the series. Third, he put Ann right at the centre of the play, by making her a kind of internal voice of conscience for Smiley - an inspired and effective device. And finally, he made sure that no matter what else was cut, the set-pieces – Smiley meeting Karla; the Tarr-Iryna story; the unmasking at the Camden house; the final Smiley-Haydon conversation; and Alleline lording it over Control with Witchcraft; were kept intact. The casting was also particularly felicitous, with the brilliant Simon Russell-Beale as Smiley. And so we come to the review. Tomas Alfredson (LET THE RIGHT ONE IN) has created a two-hour film based on a screenplay by the late Bridget O’Connor and Peter Straughan (SIXTY SIX, THE MEN WHO STARE AT GOATS). It is a free adaptation, and has to be to reduce the run-time, but the essential story and period are the same. What changes are the order in which the interlocking pieces are shown; the emphasis each part is given; and, to my mind, a fundamental misreading of the source text which results in a more facile, fatuous narrative. Let’s start with the misreading first – as this is the most important and fateful problem with the film. The first misreading has to do with the nature of the Circus, and the “victory” that Smiley achieves in uncovering the mole. For Le Carre, the Circus is anti-Bond –it’s anonymous, shabby – just a crowded office building in Soho. But in this film, the Circus is a monumental Victorian complex that contains, Bond-like, a hidden modernist cube that contains wide opening workspaces, nifty document carriers etc, wide banks of phone operators….The design of the Circus is nowhere more at odds with the spirit of the novel than in the design of the completely sealed ultra-modernistic, lurid orange block that is meant to be a kind of bug-proof inner sanctum for Control and his top men, but which looks more like an over-designed Bond lair. In the Q&A after the British Film Institute preview screening, Alfredson said that the concept came from trying to think of a completely unattached environment –closed and spy-proof- when of course the whole point of the novel is that the entire Circus has been penetrated and bugged. Worse still, once Alfredson has created this ridiculous room he feels compelled to use it for a final set-piece which is entirely out of keeping with the tone of the novel – the triumphal march of Smiley back to the room in which he and his boss were ignominiously turfed out, to sit in the chair once occupied by his boss, who has now been vindicated. The tone of that scene strikes me as simplistic and crass – and an utter misreading of the source material. A second misreading is the treatment of love. This is most striking in the near-elimination of Ann as a character. She is never seen, except as an arse that Haydon is groping at the Christmas party. The constant badgering of Smiley – the gossip he has to withstand – is absent. The pivotal cigarette lighter scene with Karla is underplayed. As a result, Smiley seems less human – more opaque (he barely speaks for the first half hour of the film) – less frail – less vulnerable – frankly, less compelling. The movie become all procedure and less emotion. The same impact is felt by the underplaying of the homosexual relationship between Haydon and Prideaux. Prideaux is just another pawn Haydon uses – his torture a political rather than an emotional betrayal – and Haydon’s murder an act less meaningful. The only hint of thwarted love comes from Kathy Burke’s Connie Sachs – a character that now comes across as more banal, less dangerously alcoholic and angry than in the novel – and Peter Guillam, who has been re-cast as homosexual and has to cast off a lover as the Circus turns its gaze upon him. The emotion that Benedict Cumerbatch displays in this parting scene is powerful – and thank god for just a flash of humanity in this emotionally arid, procedural film – but can you imagine what how much powerful that emotion would have been if placed at the very heart of the story, in the Ann-George or Haydon-Prideaux relationships? Less important, but showing a general lack of vision and understanding, are the countless small changes to the details of the novel that are scattered through the film. Of course, a screenwriter must be free to adapt his material and serve the medium of cinema rather than be faithful to the novel. But these are petty changes that do not serve to compress the material or heighten the drama, so why make a change at all? Operation Testify takes place in Hungary rather than the Czech Republic. Why? Does Budapest have a tax break on shooting there? Smiley lives in Islington rather than Chelsea. Again why? What does that add? The character of Sam Collins is given the name of Jerry Westerby, but without combining their character functions. So why not leave him as Sam Collins, and also why not leave him as the manager of a casino rather than of a pool hall? Oliver Lacon doesn’t live in a Berkshire Camelot but in a cutting edge 1970s designed house – utterly out of keeping with his character but I suppose allowing Alfredson and Hoytema to indulge their penchant for shooting through glass, as if to make some heavy-handed point that we, the audience, are voyeurs too. Why is Smiley’s B&B in Liverpool Street rather than Paddington? Just so Alfredson can indulge foreign audiences with a backdrop showing St Pauls? And, in a movie with scrupulously 1970s cars, costumes and interiors, why does the B&B look like a 2011 warehouse conversion rather than a grubby townhouse. As for the casting, it’s hit and miss. Gary Oldman is a good Smiley – the writing gives him less than he should have to work with – but he is fine. Tom Hardy is bang on the money as Ricki Tarr - John Hurt is the best Control I have ever seen - Benedict Cumberbatch is brilliant as Guillam – carrying the only truly emotionally charged scene AND the only truly dramatic interlude when he filches a file from Circus. Karla - well there is no Karla! Poor Ciaran Hinds gets nothing to do as Roy Bland. And David Dencik is completely anonymous as Toby Esterhase – one of the most compelling characters in the novel. And the usually brilliant Toby Jones is utterly wrong as Percy Alleline – he has none of the power, the malevolence, of the pompous boor. He’s just small and sniveling and hardly an opponent for Smiley. Because Bland, Esterhase and Alleline are inadequately penned and portrayed – and because Firth has just one an Oscar, the astute audience member who hasn’t read the book, will figure out who the mole is as soon as the pieces are in play. As for Firth, I think his role is problematic. The actor has charisma, but does Haydon, the character, really come across as a latter day Lawrence of Arabia? Do we get that he is mocking the bureaucratic system, that underneath that soupy charm is a deeply disaffected, cynical and selfish man? This isn't helped by the fact that the screenwriters seriously shortchange Firth in the scene where Haydon justifies his actions to Smiley. In the novel, we can't really sympathise with Haydon but we do at least understand. I’d love to hear from any readers who have had the patience to read through this essay, who have seen the film, but hadn’t read the book. I’d love to know if you really felt you left the screening understanding why Haydon had done it. Because if you don't really know why he's done it - other than some glib faux-answer regarding aesthetics, and you're left with Smiley triumphant in his orange box - what have you really learned about the Circus, about betrayal and about love? TINKER, TAILOR, SOLDIER, SPY played Venice 2011 to rave reviews. It opens this weekend in the UK and Ireland. It opens in Australia on October 27th. It opens on December 9th in Portugal, Turkey and the USA; on December 15th in the Netherlands; on December 23rd in Spain and on December 25th in Sweden. It opens on January 20th in Italy; on February 1st in Italy, Belgium, France and Germany; and on February 9th in Denmark. An excellent analysis. Not having read the book, I came away feeling the majority of characters were cold, heartless cardboard cut-outs. There was very little fleshing out of Haydon and no sense of his disillusionment with the Circus. I think 'aesthetics' is the optimal word here; brilliant evocation of the era through costume and cinematography, but very little by way of sympathy or humanity. My number one rule with films is never to watch an adaption if I can clearly recall the plot of the original novel, at least so I'm not distracted by thinking BUT THAT DIDN'T HAPPEN LIKE THAT for most of it. For me 'Tinker Tailor' brilliantly encompassed both tension and emotion, despite the very slow and careful pace of the film. The closed box sets only heighten the sense of distrust and secrecy and I think the love and sadness associated with the character Ann from Oldman's performance is so very tangible. Considering he says next to nothing for most of the film it was surprising how much depth the character had. It was far more refreshing than the 'slam bang wallop' of many spy/action films released. After recently experiencing the same with the last Harry Potter film I do understand where disappointment could stem from. However from the perspective of a teenager new to this work most of the discrepancies described seem reasonable so viewers are not completely lost whilst immersed in a world of unfamiliar names and technical jargon. It is interesting to hear that Hadley's murder was intended to be for revenge, I perceived it to be a humane killing by Jim, carried out as a final act of love to the man that had betrayed so much. Reminiscent of the love the characters have for a once proud nation, despite the evident cracks in morality and integrity that lie before their very eyes. I wonder if anyone else misinterpreted this? Impressive review, and vintage Bina! I loved this movie, and when I loved it I was certain you would hate it, so I hurried to your review. I have not read the novel, nor seen the series. For me the film painfully captured the gloom of post-Imperial (or, rather, pre-Thatcherite) Britain. It is a Britain that has lost its bearings. Amidst this, Smiley stays old school, doing his duty, even if this is not reciprocated or cannot turn the tide. You see this in his relationship with Ann as well as with the Circus. You ask: "I’d love to hear from any readers who have had the patience to read through this essay, who have seen the film, but hadn’t read the book. I’d love to know if you really felt you left the screening understanding why Haydon had done it. Because if you don't really know why he's done it - other than some glib faux-answer regarding aesthetics, and you're left with Smiley triumphant in his orange box - what have you really learned about the Circus, about betrayal and about love?" I didn't see it this way. It wasn't a glib faux-answer regarding aesthetics - or at least, it wasn't just that. Haydon's loss of belief in his country, of what it had been and had stood for, was symptomatic for the failed leadership class that had brought the country to its knees - the crowd who thought that 'managed decline' was the only option left. Although they were forced to retreat during the 1980s, their intellectual legacy -postmodernism, relativism, multiculturalism- is still very much with us today. As I understand it, Le Carré is said to be a lefty, likely sympathetic to Haydon's views. In contrast, Alfredson seems sympathetic to Smiley. This may also be why I loved the movie's ending, with Smiley in the box. Just for now, duty had defeated decadence. And, in the movie at least, he knew it. Ah Malcatraz! I am glad you enjoyed it. Regarding Le Carre's political stance, while he is centre left, his novels, and indeed his interviews, show him to find people like Haydon utterly contemptible. Well before the Spycatcher scandal, he was in the media discussing the utter slippery treachery of the likes of Philby, and post-Spycatcher, of Blunt too. (It is no surprise he makes Haydon an artist). His attitude is one of contempt for th e man who has not got the moral and intellectual courage to reform Britain - who instead, runs off to some "easy" slippery fanaticism - and largely does so because of narcissism rather than real intellectual commitment. As a regular viewer of all the Smiley movies and series I can say that Bina has hit the nail on the head. This 2011 TTSS is a dog. But even crap makes money if you haven't seen the original. It's strange to think that if they made the Jolly Green Giant purple in a movie, the US would probably nuke the studio it came from! I finally got round to watching this version, and thought I'd give you my two pence even though it's several years too late. I found it a curate's egg, less than the sum of its parts. Some of the casting is perfect - Mark Strong was born to play Jim Prideaux, the late great John Hurt was magnificent as you said, and I actually thought Esterhase was rather well drawn as well, though I wish we could agree on a pronunciation of his surname (researching the "right" way is how I came across this blog, actually!). Toby Jones is miscast as Alleline but plays the role admirably. I am used to relocating overseas shoots based on expediency, even the 70s version was not averse to such shenanigans, but renaming Sam Collins as Jerry Westerby without retaining even a shred of Westerby's character or knowledge was baffling. Making Peter gay (and thus undermining the future role of his pregnant wife) while underplaying the suggestion of a romantic relationship between Jim and Bill was equally bizarre, especially since the ending of Peter's relationship is so utterly contrived. I disagree that the traitor was too obvious: he's less obvious here than in the book or miniseries. In fact, they have to verbally tell you at the end that everyone knew it was him because they'd done such a poor job of giving you the clues throughout the film. As for the ending, I disagree that Bill does any better at explaining himself in the book, and I liked the moment when he looked at Jim before being shot. The triumphal entry into the Circus is spectacularly misjudged, and again shows a lack of respect for the continuity of the books, given how badly Smiley's time at the helm turns out. Overall, it passed the time but I'll stick with Alec Guinness next time the mood takes me. In terms of my fandom, you've probably gathered I know the books well. I read Tinker Tailor every year or two, alternating with Smiley's People. I rarely interpose the Honourable Schoolboy, as I can't manage so long in the company of Jerry Westerby, but occasionally read some of the earlier Smiley books as well, most recently a Call for the Dead.